The opening game of round six saw Carlton face Brunswick, and with both sides locked on three points each, a win in this one would prove crucial. Early on it was Brunswick who struck first through a Simone Pelletti strike which kept low on its way into the back of the net. It was two soon after as a mistake at the back saw Giovanny Garcia pounce and slot home to double their lead. A lovely piece of skill from Michele Salvi saw him punish another Carlton error for a three goal advantage, before a quality turn from Behzadpour made it four and City were running away with the contest. Garcia was on hand to tap home for his second of the contest, and before the break, Garcia had a hat trick to have his side leading six goals to nil at the break. Carlton managed to claw their way back into the contest in the second half and stem the flow of goals, but could not find the net themselves as Clayton Chappell was having a fine game in between the posts for City. Salvi would round up Nam Cao for his second of the game and a seven-nil advantage that had the game all but over. A pair of late goals to Pulvirenti & Sarip restored some pride for Carlton, but it would be too little too late as Brunswick got a much needed victory. Next up saw another relegation threatened side in Hume, face mid table outfit Regent City. It didn’t take long for Regent to open the scoring as a turnover at the back saw Ali Al Sharani pounce and give his side the lead. 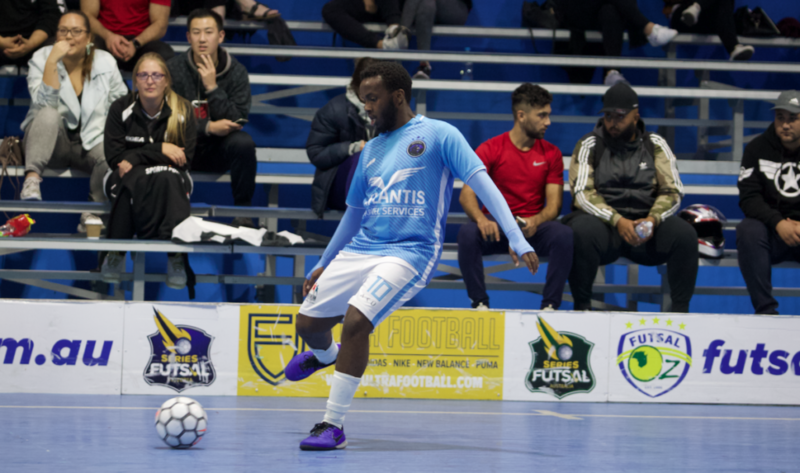 A piece of magic from Osman Ahmed saw a rainbow flick go over the leg of his opponent before he slotted home to double the advantage, and when Abdulkadir Mohamed netted for a 3-0 lead, it looked like a long night was in store for Hume. Osman Ahmed got his second of the game before the break to have his side in with a commanding 4-0 half time lead. Like the opening game of the night, the goals dried up in the second half as Hume had steadied the ship, but Regent would get themselves another a cracking strike from a side ball from Shaf Ibrahim to make it five. A late consolation from Karrar Hassany gave Hume something to take home with them, but it wouldn’t be enough as Regent ran out comfortable winners in the end. 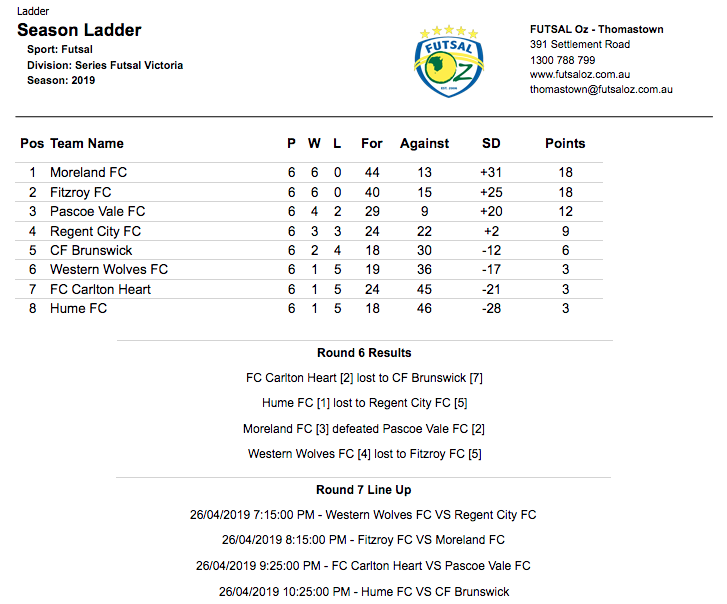 Next up saw the game of the round, as top placed Moreland faced third placed Pascoe Vale. 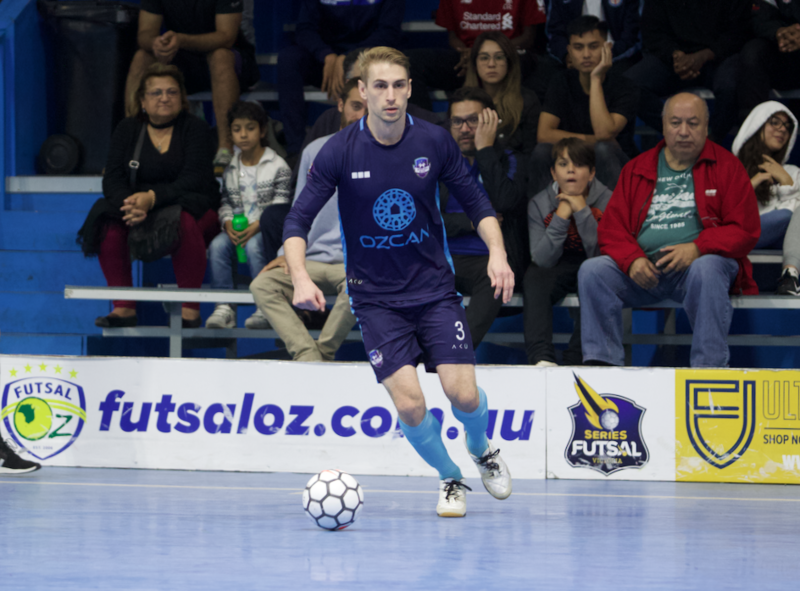 In what is always a titanic encounter, it didn’t take long to kick into gear, as Pascoe Vale struck in the opening minutes on the break through Arturo Garzon Diaz to take the lead. Moreland hit back through Adam Cooper who struck on his right foot to level proceedings, but before the break Alejandro Manuel-Gomez cut inside and found the net to have the Lions leading by one at the break. The second half saw the intensity lift from both sides, and what was about to transpire was simply breath taking. 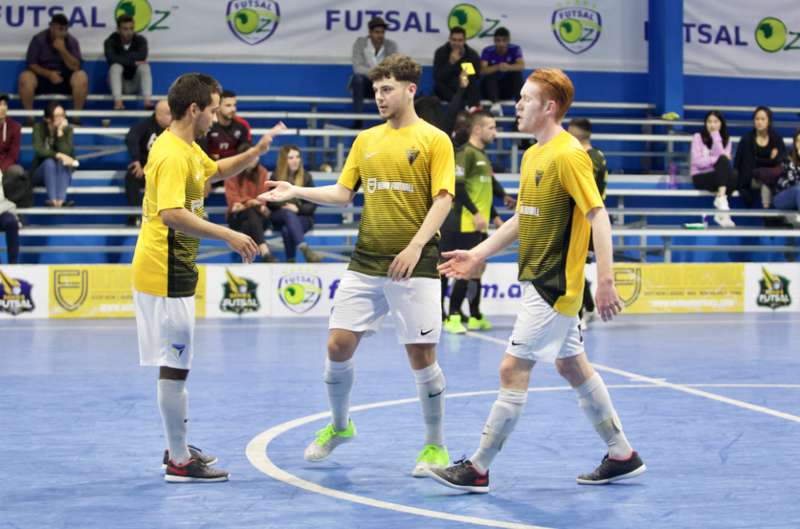 In his first game against his former side, Lucas Vaz scored arguably the greatest goal in Series Futsal Victoria history as he flicked the ball up and scizzor kicked it over the head of Felipe Bley to send the crowd wild and bring his side level. Late in the piece. Moreland found their winner as Adam Cooper rifled home from a side ball to seal all three points for the Blues as they maintain top spot on the table and their unbeaten record. 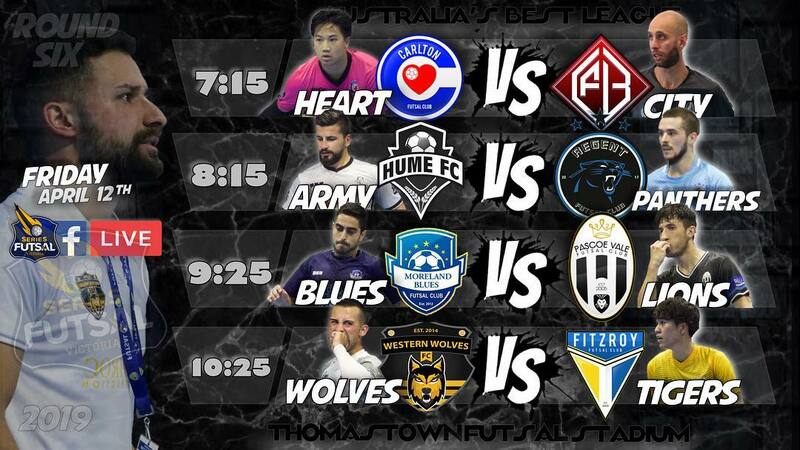 The final game of the evening saw bottom placed Western Wolves, take on second placed Fitzroy. In what was expected to be a Fitzroy victory, they opened the scoring through a Cosimo Russo strike at the back post to take the lead, before Elias Parthimos cut inside and found the bottom corner to double the advantage. Some lovely play from Fitzroy soon after saw Scott Rogan tap home at the back post as the Tigers took a three goal lead into the break. 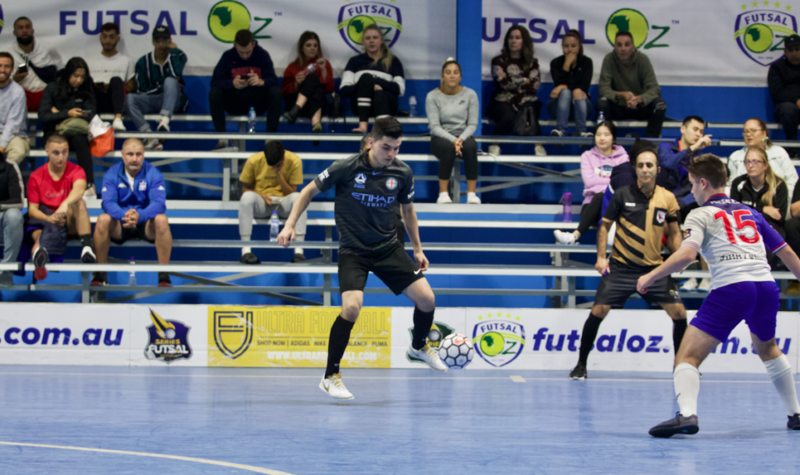 The Wolves started the second half on the front foot and got themselves a goal back through Ubeyde Cicek who tapped home to keep his side in the contest, before a similar goal from Rahimi saw the Wolves right back in it. The Wolves had their tails up and were level when Jonathan Barrientos touched inside and finished to have his side level and in with a chance of snatching the points. Fitzroy hit back through Rogan who pressured his opponent up high to force his side back into the lead, before Rogan completed his hat trick soon after to give Fitzroy some breathing space. A stunning strike from Zenfouri brought the Wolves back within a goal to set up a grand stand finish, but that is how it remained as Fitzroy survived a nervy finish for the win, while the Wolves will take plenty of positives from the game.